Germany’s ZF Friedrichshafen, which operates a large technical center in Farmington Hills, has acquired a 60 percent share of Netherlands’ mobility provider 2getthere to strengthen its position in the mobility-as-a-service and autonomous vehicle markets. Terms of the deal were not disclosed. With the investment, ZF says it is continuing its Next Generation Mobility strategy, which complements its existing activities in those emerging markets. 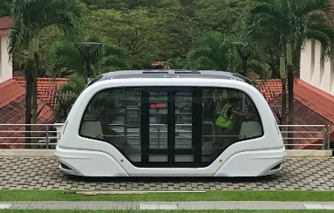 With offices in San Francisco, Dubai, and Singapore, as well as in the Netherlands, 2getthere provides complete automated transport systems including driverless electric transport systems at airports, business and theme parks, and dedicated urban transport infrastructures. “The market for driverless electric transport systems is developing dynamically,” says Carel C. van Helsdingen, founder and CEO of 2getthere. “Looking at the past three years alone, the company’s revenue has increased by 60 percent. We want to continue to lead the market and the involvement of ZF is helping us to realize our growth plans, accelerate our technology roadmap, and provide the required security for new and existing customers. Since its founding in 1984, 2getthere has accumulated more than 100 million kilometers (62 million miles) of autonomous mileage with driverless passenger and cargo transport systems in several major cities worldwide with a reliability rate of 99.7 percent.